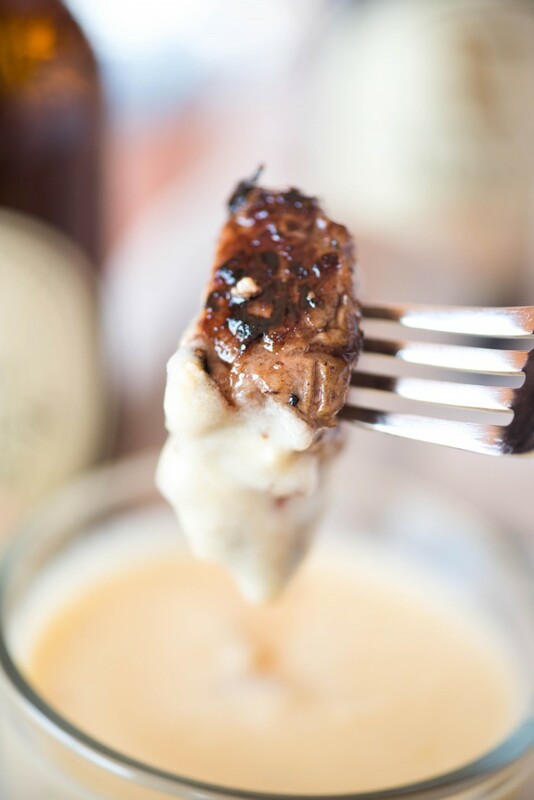 These Guinness Steak Skewers with Smoked Gouda Dipping Sauce are a fast and easy appetizer that everyone is sure to love. Perfect St. Patrick’s day food- or any day! 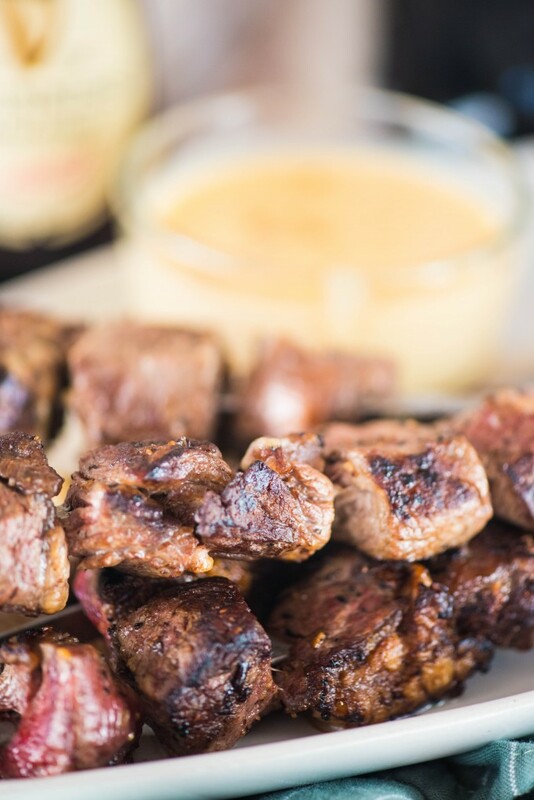 If you’re looking for a great St. Patrick’s Day party food idea, look no further than these Guinness Glazed Beef Skewers. There was a great restaurant in downtown Akron where we used to live called Crave. It was a cool place, a little trendy looking, just enough that you felt like MAYBE you weren’t in a semi-small town in NorthEast Ohio. 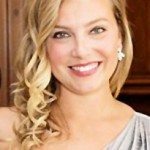 It was the first go-to option for a girls night out, drinks with friends after work, or a date night. They also had great food, including some incredible Guinness steak skewers that were paired with an amazing gouda dipping sauce. I wasn’t going to get on the St. Patrick’s Day bandwagon. I really wasn’t. But once I was on, I figured I would keep it going and recreate the succulent appetizer that I remembered from 1,000 miles away. I wasn’t quite sure what to expect as far as making it, but you’ll be pleased as punch to know that this is surprisingly straightforward to make- the longest part of the process is reducing the Guinness. Word of warning: WATCH THE GUINNESS. I didn’t do this the first time around. First, it boiled over (and let me tell you right now, it is frustratingly difficult to clean up boiled on, scalded, burned Guinness), and then I walked away to grill a pizza and it finished reducing VERY quickly- then I had a burned on mess in the pan. All in all, burned on Guinness is a bear to clean up and will make your kitchen smell like, well, burned Guinness. But if you actually WATCH what you’re doing, its super easy. Cube beef, thread it on skewers and season with steak seasoning, then brush on the reduced Guiness while you sear them. You could do this on the grill outside as well, but doing it on some sort of a flat top is prefereable. 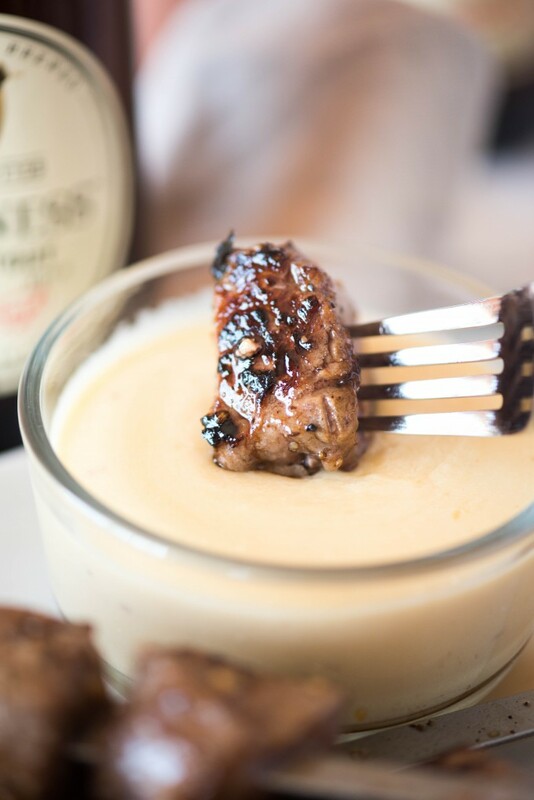 The Guinness will caramelize as it drips off the steak and on to the pan. You can brush this super-reduced Guinness onto the skewers for even more flavor impact. The gouda cheese sauce is really straightforward as well. The actual cooking portion of this took about 10 minutes, and was a hit with all three of us. Jonathan was a huge fan of the fact that he got to dip and was in love the gouda fondue- we had to have a talk during dinner about how we don’t just eat cheese sauce with a fork. WHICH I HAVE DEFINITELY NEVER DONE. 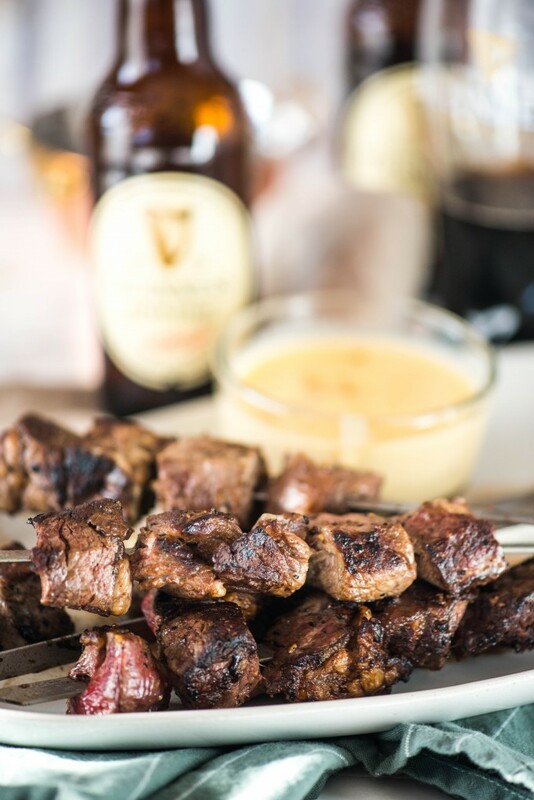 These Guinness Steak Skewers with Smoked Gouda Dipping Sauce are a fast and easy appetizer that everyone is sure to love. Pour the Guinness into a small saucepan over medium-high heat. Bring to a simmer and reduce until the liquid measure approximately ⅓ cup. 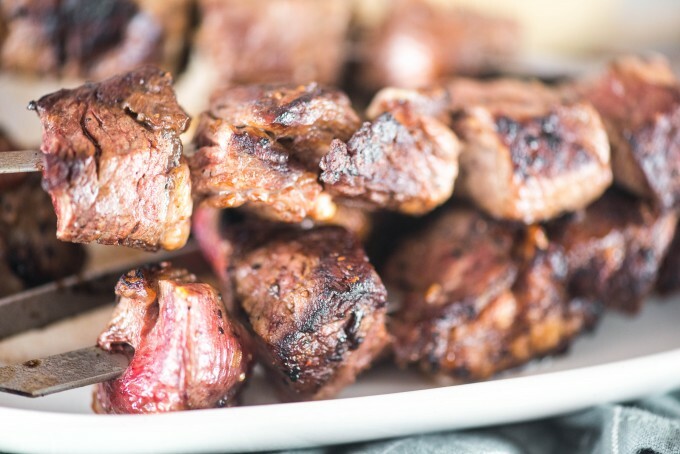 Thread the beef onto skewers and season with steak seasoning. Heat a flat stop griddle, grill pan or large skillet over high heat. 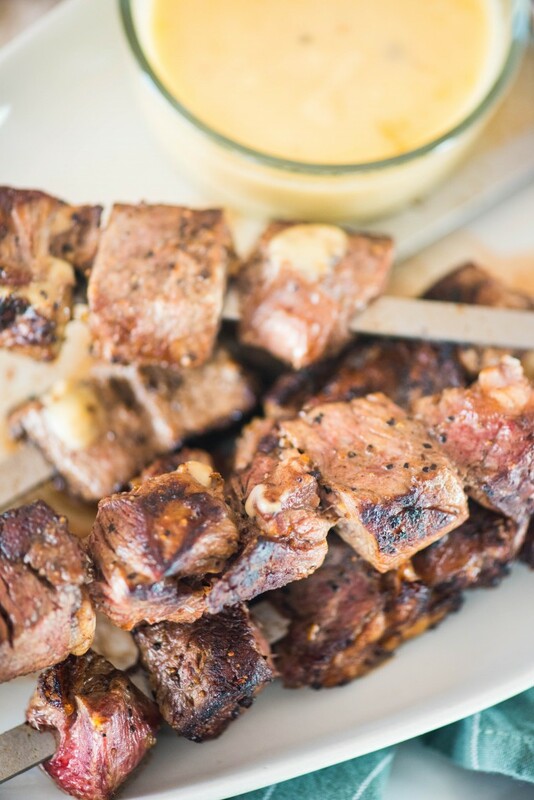 Drizzle the skewers with olive oil. Add the skewers to the pan and brush the top generously with the Guinness reduction using a basting brush. Sear the steak for 2-3 minutes before rotating the skewers ¼ turn, again brushing the reduction on the top side. Repeat until all four sides have been seared and all the reduction has been used. Turn the skewers to coat them in the boiled down Guinness sauce on the pan. Remove to a serving platter. Meanwhile, in a small saucepan over medium heat, melt the butter. Whisk in the flour and cook for 1-2 minutes, then slowly whisk in the milk. Once the milk has thickened to a cream-like thickness, whisk in the gouda, ⅓ a time, waiting to add the next batch until the previous one is fully incorporated. Season with freshly ground pepper and pour into a small bowl. Serve alongside the skewers. You can use your preferred cut of steak. Tenderloin, of course, is wonderful, but even sirloin does the job well! What if you don’t like stout is there something else that could be used? For what its worth, I don’t like stout either and love these. 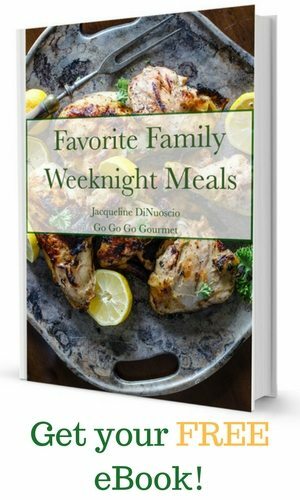 You could use whatever kind of steak sauce or marinade that you’d like. I’m not a stout beer fan either my suggestion and what I’m currently trying is the Guinness Blonde.Not quite as strong but should give the great flavor! Delicious!! This is definitely a keeper !